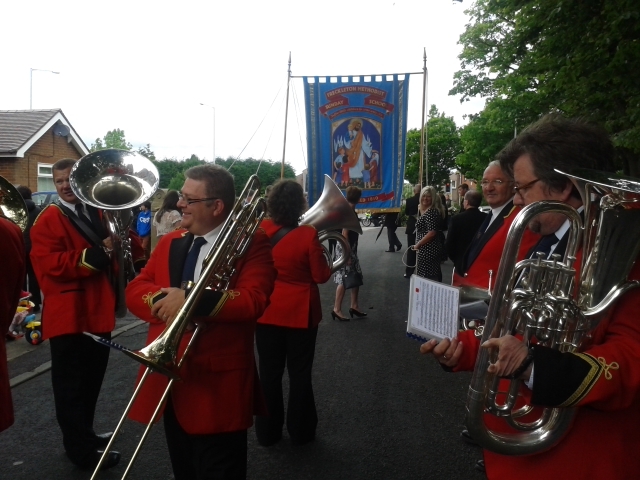 Hundreds lined the streets of Freckleton on Saturday morning to watch a procession through the village’s streets, led by the Freckleton Band, for Club Day. The sunshine made a welcome appearance after the previous years’ rain, although the strong breeze did leave us a liittle breathless by the time we had reached the end of Kirkham Road. Jayne, our 1st horn player, managed to get a few pictures of some smiling faces at the beginning of the march! See also the short Blackpool Gazette video and article. This entry was posted in Freckleton and tagged Community, March, Village by grumbal. Bookmark the permalink. That looks like George Clooney!